‘I am the servant of the Lord. May it be done to me according to your word’ Luke 1:38. Pope Francis issued a powerful ‘wake up’ call to hundreds of thousands of young people from 155 countries, in his homily at the closing Mass of the World Youth Day in Panama City, Panama, on Sunday, January 27. 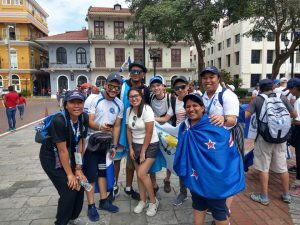 A contingent of 21 New Zealanders joined the thousands of other young pilgrims from around the world at the 34th WYD in Panama. The theme was, ‘I am the servant of the Lord. May it be done to me according to your word’ Luke 1:38. The official events began on 22 January with an opening Mass and concluded on Sunday 27 January with Pope Francis celebrating a Mass, preceded by an overnight vigil, and attended by estimates of around 750,000 people. 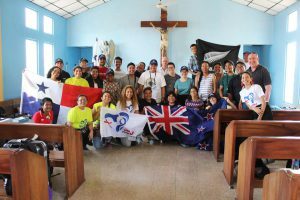 Bishop Charles Drennan of Palmerston North accompanied the New Zealanders on his first World Youth Day. ‘I’m excited by the renewal Pope Francis is bringing to the Church and this pilgrimage of faith to Central America is full of the joy and sense of mission that radiates from so many of our young people,’ he said. Over the five days of the festival, thousands of participants heard daily sessions hosted by bishops from throughout the world and joined in with events throughout the afternoons and evenings. At the Vatican’s request Bishop Charles led one of the three Catechesis sessions for English-speaking pilgrims. His topic focussed on Christian service and a reference to Mary’s acceptance of God’s request to her to be the mother of Jesus. Following his catechesis Bishop Charles directed a general Q&A session. 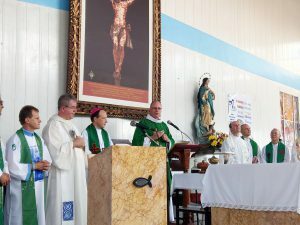 He also presided at Mass for English-speaking pilgrims on one of the days before Pope Francis’ arrival and gave the homily. Tour manager Dave Mullin secured the New Zealanders prime tickets to the opening ceremony, where Aotearoa pilgrim Jack spoke to the Pope on behalf of all the Oceania pilgrims. At the end of the Mass, Pope Francis announced that the next World Youth Day will be held in Lisbon, Portugal, in 2022.